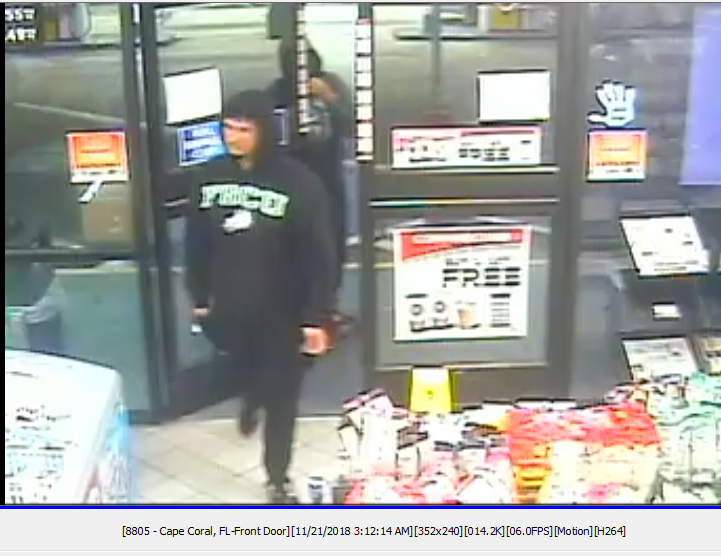 (November 21, 2018)- The Cape Coral Police Department Major Crimes Unit detectives are releasing this short surveillance video and still photographs in hopes that someone may be able to identify the two suspects. This is in reference to the armed robbery at Circle K, 1829 Skyline Blvd on November 21, 2018 around 3:12 AM. The original release can be found here. If you have any information on the identity of the suspects, please contact the Cape Coral Police Department at 239-574-3223. You can also submit an anonymous tip. Go to www.capecops.com/tips or text a tip- text CCPD+"Your Message" to CRIMES (274637). Finally, you can call Crimestoppers at 1-800-780-TIPS. Detective Thomas Kortright is the detective assigned to this case. Please use this Case Report # 18-022592.